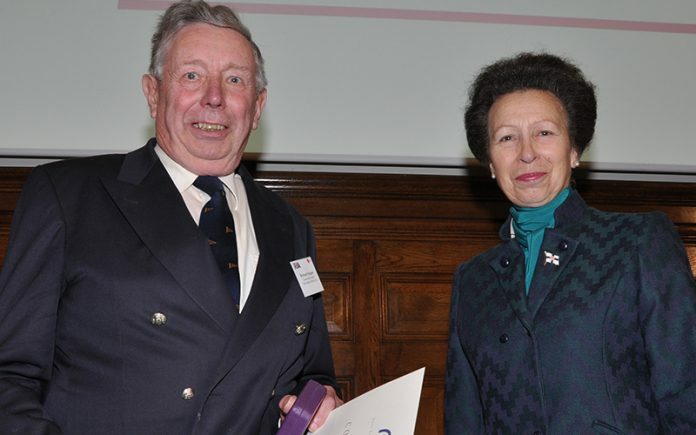 A Rye sailor had his outstanding volunteer endeavours recognised by The Princess Royal at the annual Royal Yachting Association (RYA) volunteer awards in London last Friday [November 21]. Richard Hopper, of Rye Harbour Sailing Club, was among some 47 winners from across the UK honoured for their exceptional generosity and dedication to boating. Hopper received an RYA Lifetime Commitment Award and was presented with a commemorative medallion and certificate by HRH, president of the RYA, at the awards ceremony and exclusive luncheon held at One Great George Street, Westminster. Addressing guests, Princess Anne hailed the volunteers for bringing more people into the sport, maintaining the professional approach of the activity, and stated how sailing sets a very good example across all sports of maintaining these high standards. She also stressed that for any sport to continue it has to be fun for everyone involved, and she thanked the volunteers for keeping the essence of enjoyment alive in sailing. Duncan Truswell, RYA sport development manager, added: “The RYA volunteer awards are all about celebrating the commitment of the countless volunteers who do fantastic work to support our sport. These people are the lifeblood of our sport; they keep our sailing clubs, events and organisations thriving and make it possible for others to get out on the water. To read about Hopper’s achievements, see Princess to honour Rye yachtsman.